Over the last few years liberals and progressives who had been critical of him have warmed to Harry Reid. Throughout Reid’s tenure as head of the Senate Democrats–first as Minority Leader, and the last seven years as Majority Leader–a sizable swath of highly engaged progressives and partisan Democrats have been frustrated by the Senate Democrats’ frequent failures at overcoming Republican obstruction. Despite plenty of evidence to the contrary, a lot of people saw Harry Reid as someone afraid to fight. After deciding he was a wimp unwilling to stand up to Republicans, many of Reid’s critics are now heartened by the “new” Harry Reid, the guy who said Mitt Romney didn’t pay any federal income tax, who calls nutjobs nutjobs, who just doesn’t seem to give a rip if his statements about Republicans come off as intemperate, and most impressively, the guy who was essentially the Democrats’ field general in last year’s government shutdown, and who prevailed upon the President to Not. Back. Down. 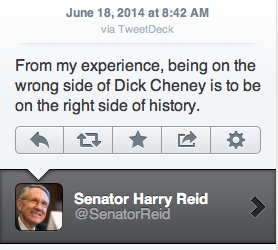 I doubt this is a new Harry Reid. It’s possible Reid feels free to let his fighter flag fly because he knows nobody can touch him. He may not run for reelection in 2016, but even if he does, with the strong Democratic trend in Nevada, he probably (and rightly) figures that if he could survive in 2010, that should he choose to run again he should win comfortably. More likely, though, is Harry Reid seems newly combative because his new caucus is more combative. Most of the institutional/process conservatives–people like Robert Byrd and Carl Levin, who despite their overall politics, generally opposed institutional change–are already or soon to be gone. Most of the conservative Southern Democrats had retired or been defeated by the time Reid took over in 2005. The Southern Democrats since have mostly been quiet nationally, and not the types who regularly speak ill of their party. There were, of course, several Democratic Senators from outside the South who could be counted on to criticize Democrats and often sell them out, but the worst of the bunch–Joe Lieberman, Evan Bayh, Kent Conrad, Russ Feingold, Ben Nelson–are gone, and the current members from conservative states (Mark Begich, Kay Hagen, etc) don’t try to protect themselves at home by badmouthing their party to the national press. Reid also doesn’t have to contend with the big personalities and Senate institutions who were in the caucus when he took over. Ted Kennedy and Robert Byrd and Daniel Inouye passed away. Joe Biden and Hillary Clinton and eventually John Kerry went to the executive branch with Barack Obama. And the big names who came in to the Senate in recent years–Obama, Al Franken, Elizabeth Warren–were new to Congress, and have only known one leader, Reid, so they were less likely to expect or insist on prerogatives they had under Tom Daschle or George Mitchell. Finally, many of the newer members, like Jeff Merkley, Sheldon Whitehouse, Chris Murphy, and both Senators Udall–are committed to significant procedural and institutional change, most notably with regards to the filibuster and cloture. And unlike as recently as a few years ago, when Joe Biden could claim that we couldn’t come up with any solutions to national problems unless we had a consensus, almost every one of the newer Senators realizes consensus and bipartisanship are, because of the current state of the GOP, impediments to progress and a surrender to reactionaries. Harry Reid may be more inherently combative, more likely than he was nine years ago to say something that the tut-tutters of elite centrism will find too blunt and coarse. But his new tone isn’t likely a reflection of personal change, as much as a result of personnel change in his caucus. He’s now reflecting the mainstream of his caucus, if not in tone, at least in their understanding of conflict between the parties. It’s taken two decades, but most DC Democrats now have fully internalized that until the GOP changes there is no meaningful compromise with them. And that may be one of the best things to happen in American politics in a long, long time.